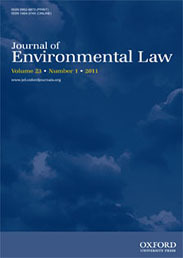 Condensing essential information into just three issues a year, the Journal of Environmental Law has become an authoritative source of informed analysis for all those who have any dealings in this vital field of legal study. The journal offers major articles on a wide variety of topics, refereed and written to the highest standards, providing innovative and authoritative appraisals of current and emerging concepts, policies, and practice. Environmental law has not been taught or seen as a ‘core’ legal subject, giving environmental law academics freedom to teach the subject in many different ways. This structural sidelining, however, belies important questions about how teaching environmental law relates to the core of legal learning. We are not suggesting that there is a core of environmental law knowledge that every student should learn (although there is lots to learn), but that it is important to reflect on whether there are core legal concepts, reasoning processes and skills that all environmental lawyers should have. This issue is now particularly pertinent as the Solicitors Regulation Authority in England and Wales is ‘releasing’ the LLB from its conventional structure of core legal subjects, so that existing assumptions about how environmental law relates to the core of (undergraduate) legal learning are up for grabs. Thinking about the relationship between environmental law and the core of legal learning depends on one’s view of what that core is, and, fundamentally, on what a law school is for. The debate over the latter question is long-standing, with William Twining identifying struggles between ‘academic’ and ‘professional’ models of law schools, reflecting diverging ambitions to pursue liberal arts education or to lay the foundations for entry into the legal profession respectively. This debate is caricatured by fixed understandings about the structure of UK law degrees. A preset list of subjects and skills – as currently set out in the ‘Joint Statement’ regulating the form and content of UK ‘Qualifying Law Degrees’ (QLDs) – forms the ‘core’ in most of our law schools. Knowledge about law is seen to come from learning these conventional, fixed ‘core’ subjects (public law, criminal law, etc.). While using these knowledge blocks is one approach to teaching, we suggest that the core of legal learning is more fundamental, less functional and less structural: the core essentially concerns key legal concepts and skilled approaches to legal reasoning. Thinking about the core of legal learning in this way has two implications for teaching environmental law. First, it explains why the relationship between environmental law and standard ‘core’ legal subjects can be fraught. Recent research surveying UK law schools (by Steven Vaughan and his UCL students) shows that almost all law schools teach law in the blocks of the QLD, with environmental law offered as an optional subject, usually in the final year. A notable exception is the University of York, which takes a ‘problem-based learning’ approach to law. Environmental law dominantly being an option suggests that it is an ‘extra’ to the core of legal learning, a ‘nice to have’ for students if they care about the environment and can forgo other subjects often perceived as more relevant for their future careers. As environmental law teachers know well, we are faced with difficult pedagogical and disciplinary decisions in teaching environmental law. Can we assume that environmental law students have learned or assimilated enough foundational legal knowledge that we can expect them to ‘apply’ this or move beyond this in learning about law that relates to environmental problems? Can we explore interesting facets of environmental law – examining new regimes or complex legal questions in a range of legal areas – safe in the knowledge that students understand basic legal doctrines, procedures and frames of analysis? In our experience, the answer is often no. Students can struggle to connect their foundational legal knowledge to environmental problems, or this connection may be obscured through teaching choices that stray from ‘core’ legal concepts and skills. This leads to the second reason for thinking differently about environmental law and the core. We need to acknowledge that we are imparting, testing and critiquing core legal concepts and legal reasoning processes when we teach environmental law. With that acknowledgment comes a responsibility to reflect on our choices as environmental law teachers, and potential opportunities. How much do we need to teach basic legal doctrines and concepts in environmental law? What are those concepts? Where does this foundational teaching fit in the syllabus of an optional course? Might we want to restructure some parts of legal degrees to teach key legal concepts and reasoning more explicitly through the framework of environmental problems (inspired by the York approach)? We have taken some small steps in this latter regard at UCL, where a new compulsory first-year module – Law’s Connections led by Professor Maria Lee – includes a climate change case study that provides an intensive introduction to the study of law and the role of law in addressing social challenges. At a minimum, we would argue that environmental law is ideally placed for students to develop certain ‘core’ skills of legal reasoning. In particular, it is a subject in which we can promote students to have intellectual versatility in their legal reasoning, seeing and framing issues through different legal lenses – doctrinal, regulatory, philosophical, and so on. It is not a subject in which we can pretend that only one approach to law is right, and it requires flexible and critical legal thinking. This is not to say that anything goes in teaching environmental law but that robust, carefully chosen, and self-conscious analytical legal reasoning is required. Developing these skills is a core aspect of legal learning. There is nothing necessarily niche or of the ‘fringe’ about environmental law in the classroom. In the way that we frame, phrase and organize our environmental law classes, we are defining the approach to our subject for future environmental lawyers and future citizens, and also expressing a (usually unarticulated) view on the role played by a law school. The time is ripe to reflect on the skills, approaches and visions for environmental law that we impart to our students, and how these relate to the core of legal learning. We need to identify the ‘core’ functions that an environmental law education might serve, and how our teaching meets these, or doesn’t, or can’t. Featured image credit: Blur-Book-Stack by Janko Ferlic via Pexels. Professor Eloise Scotford and Dr Steven Vaughan are members of UCL’s Faculty of Laws and UCL’s Centre for Law and Environment. Professor Scotford is co-author of Elizabeth Fisher, Bettina Lange and Eloise Scotford, Environmental Law: Text, Cases and Materials (OUP 2013). The Journal of Environmental Law is holding a workshop on “Environmental Law in the Academy” on the 21st November 2018 at the Centre for Law and the Environment, UCL Faculty of Laws. Further details can be found here.